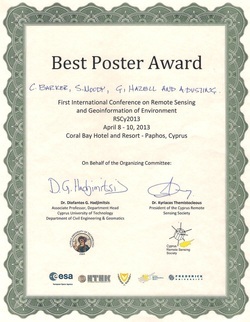 We recently won an award at the first International Conference on Remote Sensing and Geoinformation of Environment held in Cyprus for the Best Poster. The poster was on our GPR work conducted in 2010! Dr Craig Barker "Fifteen years of archaeological research at the Ancient Theatre of Nea Paphos"
Dr Craig Barker, "Recent archaeological investigations of the theatre and surrounding urban landscape of Hellenistic-Roman Paphos"
The afternoon will conclude with drinks in the museum. Dr Tom Davis (CAARI) "Current Cypriot Archaeology"
Thomas W. Davis is the director of the Cyprus American Archaeological Research Institute in Nicosia, Cyprus. Dr. Davis has an extensive history of archaeological excavation in Cyprus, Jordan, Egypt, and in the United States, where he has substantial archaeological experience in cultural resource management. He is the author of Shifting Sands: The Rise and Fall of Biblical Archaeology (Oxford, 2004), as well as numerous essays and articles that concern archaeology and biblical studies. Dr Tom Davis considers Cypriot Archaeology as dynamic and vibrant. This lecture recounts the latest discoveries and advances from current work on more than 20 sites, focusing on the last 2 years. The chronological range is from 10,000 BC to the Ottoman period. The University of Sydney is pleased to announce the 13th campaign of excavations will take place in October and November 2010. The Paphos project is pleased to announce a new sponsorship program with the AAIA (Australian Archaeological Institute at Athens). Craig Barker of Sydney University Museums explores the work conducted by The University of Sydney on the Hellenistic-Roman theatre in Paphos in Cyprus since 1995. The theatre of Paphos, constructed in c. 300 BC, hosted performances and entertainment for over six centuries. At its greatest extent, under Roman control, the theatre could seat an audience of 8000 spectators. Discover how this ancient theatre has been exposed from the ground through careful archaeological investigation and what this research means for our understanding of Cypriot history. Read about the project in the Oct-Nov 2008 and Dec 2008-Jan 2009 issues of Archaeological Diggings magazine. Call for student positions: 3-30 October 2009. The University of Sydney’s excavations have been running at the site of the Hellenistic-Roman theatre of Nea Paphos in Cyprus since 1995. Excavations in recent years have focused on the south eastern area of the theatre exploring a Roman building with mosaic floor and a related road surface; with further investigation of the urban region of this quarter of the ancient city planned for this season and future years. In 2008 excavations will focus on trenches located to the south east of the ancient theatre that has been excavated since 1995 under the direction of Professor Richard Green. The season will run for four weeks between approximately 5 October and 5 November 2008. Professor J.R. Green "Fabrika Ancient Theatre"
Cyprus Today is produced by the Ministry of Education and Culture of Cyprus.